Ever wondered why every website you visit tries to give you a valuable freebie in exchange for your email address? Take a sneak peek at these email marketing stats most brands analyze, then you’ll understand why emails are integrated into their marketing strategy. Email marketing is the most effective form of marketing out there. It allows you to get a little more personal and close with your audience than blog posts. The personal touch in email fosters trust and credibility with your brand, making your conversion rate bound to skyrocket as your subscribers will be more open to any product recommendations or offer you send through emails. Without traffic, conversion and sales are hard. Get my Traffic Blueprint For Blogs to generate more monthly visits and ROI on your email marketing efforts. Just in case you’re looking for an email marketing software for your blog, it must be able to automate campaign emails or have an autoresponder and re-send emails to subscribers that didn’t open the first time, in order to maximize your open rate. ConvertKit allows you to do just that. With their killer feature known as Resend To Unopens, ConvertKit allows you to resend emails to subscribers that failed to open the first time. This is a sought-after feature for most marketers, as it can increase your open rate and conversions. If you sent out an email directing your readers to your blog post and some of your subscribers didn’t open, you can change the heading to a catchier one and resend the email, maximizing traffic to your website. Maybe you sent out an email about a product to your subscribers, you can also utilize the Resend To Unopens feature to increase sales. All you need to do is sign up for Convertkit here and start building your email list. Feel free to tweet these email marketing statistics that’ll help to increase conversions and boost sales for your brand. Emails generate higher conversions than social media because of the option for message personalization (using the first or last name of subscribers), closeness, credibility, and trust. Most email marketing software provide the option of segmenting subscribers based on their interests. For example, a reader that signs up for your freebie on DIY tools might not be interested in your fashion accessories content upgrade. That’s where email segmentation comes in, wielding an advantage over social media posts that have no room for personalization and segmentation. You can create two different email campaigns for subscribers on “DIY tools” and “fashion accessories.” That way you’re going to see a boost in conversion and sales. The most popular email marketing software that offers email segmentation is ConvertKit. Try it out. More than half of emails are now opened on mobile devices. The email marketing software you opt for should be able to deliver mobile-friendly emails to users. Google has noticed that most internet users access the web with mobile phones. Emails are not left out. Using a mobile-friendly email marketing software is sure to increase your open rates. A high majority of mobile users delete emails that look ugly on their phones. Mobile users are very blunt and expect a level of email responsiveness on their mobile devices. A quick fix to this would be to format your text in a way that is pleasurable to read by breaking up long blocks of text into single line paragraphs. You could also use call-to-action buttons instead of links as they’re easier to click on. Coschedule analyzed email data from several email marketing software like MailChimp, GetResponse, CampaignMonitor, Wordstream, and others. It was noticed that most of the email opens were recorded on Tuesday. Thursday was the second best option, followed by Wednesday. It’s easy to find out the best day to send emails to your audience. What works for others might not work for you. Over a month, you could schedule emails to send to your subscribers on different days and analyze which email had the highest opens. Sending emails at the wrong time of the day can lower your open rates. The same email analysis from Coschedule revealed 10 a.m. as the prime time when subscribers opened their emails. Some marketers have seen success in sending emails at 11 a.m. However, 8 p.m., 2 p.m., and 6 a.m. came in as the second, third, and fourth best times to send emails respectively. You must have read somewhere that readers prefer visual content to plain text, right? Well, emails are an exception. Emails without images or visuals actually have a higher open rate, despite people saying otherwise. The more the images or visuals, the lower the open rates. Strange but true. Often times, you get that email you can’t afford to read at the moment as you’re super busy, so you save it for later reading. Research shows that most people don’t come back to read those emails. The elderly leave their emails unread in an attempt to read it later, the teenager stars it using Gmail starred messages option, while the young man or woman marks it as unread. One thing is certain though, it stays unread forever. To combat this issue of people saving your emails and not reading it later, try resending the email again, especially to those who haven’t opened it yet. ConvertKit has a feature for that. Your email will get a chance to be on top of their inbox again. Segmented emails were found to have a higher open rate than non-segmented emails. Segmented emails are emails sent out to a particular group of subscribers based on what action they took on your website. Sending out emails to subscribers based on interests has a 14.32% higher open rate as you’re sending them more information on what they want to know. Emails sent based on interest and behaviors were shown to have a massive hundred percent click-through rate than emails that weren’t segmented. Aside from that, non-segmented emails also had 9.37% unsubscribes higher than segmented emails. More than half of e-commerce marketers use email marketing software like GetResponse, ConvertKit, SendBlue, Hubspot CRM, for email automation. Email automation is great for setting up a series of email campaigns to drive sales for your product. You must have heard some marketers say when it comes to digital marketing, “the money is in the email list.” That’s very true. Email marketing automation software enables you to schedule emails to go out at different time intervals to your subscribers. Personalized emails simply refer to emails containing a subscriber’s first name or last name. Mentioning your subscriber’s name in the subject line of your email is twenty-six percent likely to get the email opened. Most email marketing software has the option of personalization with the subscriber’s first or last name. Something as little and thoughtful as this results in more opens for your emails. Experian found out in their marketing services study that personalized emails had a six times higher transaction rates than non-personalized emails. Mentioning your subscriber’s name in your email can lead to more sales. It’s understandable because it infuses individuality and comes across as non-promotional as compared to non-personalized emails. Companies realize fifty-eight percent of their revenue from promotional emails that are segmented. Blanket emails that are sent to all subscribers decreased to 14% of all email revenue since 2014. 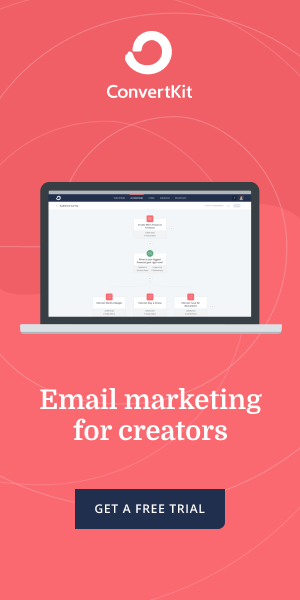 Email marketing automation tools like ConvertKit offers the option of segmenting subscribers and delivering emails based on their interests. Email subscribers are your most loyal and devoted followers. And because of that, they are three times more likely to share your content than visitors from other sources. Majority of the traffic potential of your website lies in the size of your email list. It’s a good practice to start building your email list from day one. Derek Halpern ran a test where he sent his latest blog post to the same number of people through email and Twitter. 300 people clicked through to his post on Twitter, while 4200 clicked through from email. It was seen that email had six times higher click-throughs than a tweet. People take action more on emails than on social media. Focusing on email marketing will yield a higher ROI than social media marketing. Facebook has over 1 billion active users per month. Twitter has 255 million users per month. In 2013, there were 3.9 billion email accounts and it was expected to increase to 4.9 billion email accounts in 2017. With 4.9 billion email accounts, it means there are three email accounts for every one account of Facebook and Twitter combined. All the more reason we should focus on email marketing more than social media marketing. A whopping seventy-two percent of people prefer to receive promotional emails via emails, mainly because they gave their permission to be subscribed. They took a conscious action to receive information, unlike passive social media users. A good way to attract more subscribers to send a promotional email to is by using a lead magnet. A lead magnet is a content upgrade or related content accessory attached to your blog post that provides additional value to readers. Lead magnet converts better than a simple “subscribe to my newsletter” form. Every £1 spent on email marketing yields £38 on average, resulting in a 3800% return on investments. That’s a huge amount of returns compared to other marketing channels. To get started with email marketing, ConvertKit is a great option for bloggers and serious internet marketers. Google, the most popular email service, now has seventy-five percent of users who access their emails on mobile devices. Mobile users now constitute the majority of internet users, as well as email users. All the more reason you should opt for a mobile-friendly email marketing service. When coming across an email for the second time, twenty-three percent of mobile users were more likely to open it to see what it contained. With the easy portability of mobile phones, there is a high chance mobile users will stumble across an unread email the second time and open it. After emails are opened for the second time, the click-through rate rises by sixty-five percent. One good thing about emails is that a consumer can always come back to read it. Email marketing has gone from getting a subscriber to click through on the first open to holding their attention long enough for them to get back to the email a second time and take action. A new study found out that including a button instead of a text link can result in more conversions. The reason why buttons convert better is that it catches the attention of email readers who scan the content instead of reading word-for-word. Plus, it’s easier to click a button on mobile devices than it is to click a link. You might want to try adding a call-to-action button in your next email campaign and check the results. The majority of click-throughs in an email occurs when it’s initially opened. Whether you intend for your subscribers to click through to a product sales page or a new blog post, the call-to-action should be relevant and compelling enough to get clicks on the first email open. Most subscribers open their email with the iPhone device. The iPhone accounts for 61% of all email opens on mobile, iPad has 26% of mobile email opens, iPod Touch has only 1%, leaving Android devices with 12% of all mobile email opens. Since Apple devices usually display images by default in an email, thereby automatically registering an open, we cannot be sure of this data. This stat must’ve been slightly distorted as Android devices do not display images by default and automatically register an open. A little over half of the internet marketers reported a moderate to significant increase in revenue when they constantly kept their brands in touch with customers via emails. A good way to professionally keep in touch with your subscribers is to automate your email campaigns. Most email marketing software like ConvertKit is built with provision for automated email campaigns where you schedule emails to be sent over a specified number of days. Email marketing is an incredible way to build a relationship with your audience and make sales. The money is really in the email list. Segmented emails generate a massive 760% revenue for digital marketers. Subscribers are more likely to respond to an email that is tailored to meet their needs. Marketers can tell a subscribers’ interest from the opt-in form they signed up for to get into their email list. Judging from the lead magnet a subscriber signed up for on your website, you can tell what their interests are and segment them to an appropriate email campaign. Then you can run laser-targeted promotional emails to them and experience a 760% boost in revenue. Personalized email is a little strategy marketers use to boost sales. To utilize the personalization feature, add a field for the First Name or Full Name on your lead magnet opt-in form. By adding a First Name or Full Name field, you can insert personalization shortcodes that’ll mention your subscriber’s name in your email. Social media channels such as Facebook or Twitter do not come near emails as an effective way of acquiring new customers. Emails deliver better results in customer acquisition than all social media channels. The earlier you start building your email list, the better you’ll grow your customer base and revenue potential. Start growing your email list with ConvertKit. U.S. online shoppers said they were willing to receive promotional messages from a brand they’ve previously purchased a product from, as long as they take into account their previous shopping habits. Heck, 81% of them said they could make an additional purchase because of those targeted emails. That’s the power of email segmentation in operation. Targeted emails simply equal satisfied customers and increased sales. Email has become an integral part of our online experience. Without having an email, you cannot sign up for any social media channel or other websites. Radicati discovered that messages in emails are five times more likely to be seen than on Facebook. The primary mode of communication for most companies and online businesses is through email. And since emails can now be accessed by mobile devices, messages in emails can easily be seen before those on Facebook. Visitors that make a purchase from email marketing are twice as much as those that make a purchase from search engines like Google and Bing. Fewer record of sales is made from social media. Email marketing is a strategy that we should leverage, not underestimate. With 91% of U.S. consumers using email daily, emails lead to purchases three times more than social media. A new report claims that the value order of email is higher than social media. Emails undoubtedly rank higher than social media in the arsenal of digital marketers. Marketers use four metrics to evaluate the effectiveness of an email campaign. They are click-through rates, conversion rates, open rates, and ROI. Sixty percent of marketers focus on conversion rates when gauging the effectiveness of email marketing. Seventy percent use click-through rates and the least percent of online marketers use ROI to determine if their email campaign is effective or not. Email generated 4x the ROI of direct mail. Hence, marketing through emails has become the preferred promotional method by digital marketers. The ROI of direct mailing is steadily decreasing against the rise and dominance of emails. Eighteen percent of marketers confess that for every one euro spent, they make more than seventy euros in return. It’s only a little percent of marketers that enjoy this high returns on email marketing, meaning they must be doing something different from the majority of other marketers. Interaction workers include salespeople, managers, professionals, teachers, or any skilled professional who spends time relating to people. These people spend over one-third of the week in their email inbox. Managing emails take up a considerable amount of time in the schedule of most professionals. Almost all adults online use email, with sixty-one percent using it on an average day-to-day basis. Emails are unarguably the best channel for corporate and commercial communication. As early as 2002, more than one in ten adults were already using emails. The numbers must’ve risen astronomically high by now. The “from” name is usually the name of the company where the email is being sent. Sixty-eight percent of Americans check out where an email is from before deciding to open. A good way of optimizing the “from” name is by aligning it with the name of the brand the subscriber opted for. The “from” name should be the brand that your subscribers are familiar with, not just some random employee’s name. Almost all the time, email campaigns get delivered into your subscriber’s inbox. Only in very few cases does it get marked as spam, if that ever happens at all. But with Facebook’s dwindling organic reach, only two percent of your followers actually see your posts. Building your email list is a smarter strategy than building a community on Facebook. You own your list, but you don’t own Facebook. Also, you have no control of Facebook’s algorithm changes that continually reduces the organic reach of your posts. Microsoft Outlook accounts for over half of all desktop email opens and sixteen percent of email opens on mobile, tablet, and desktop devices. However, marketers are finding it hard to code for Outlook and use it effectively for email marketing. 61% of American workers are of the opinion that email plays a crucial role in helping them carry out their job activities. That’s six in every ten workers. Email is already a vital aspect of most businesses. Among other content marketing tactics such as social media content, case studies, blog posts, eighty-one percent of marketers prefer to use email newsletters as their strategy. Emails produce amazing results when it’s integrated into your content marketing strategy. Database Marketing Institute found out that email open rates do not increase the more marketers send out emails. As a matter of fact, they found the opposite to be true. The fact that emails are a little inexpensive to send out acts as a subtle temptation to over-use the platform. Some experts recommend sending out two emails a month for optimal open and click-through rates. A survey of email marketers from the U.S., Germany, and France revealed that marketers from the U.S. have a better understanding of email marketing than others. At 1.47 million emails per month, U.S. companies sent the most emails, had the highest database of over 500,000 email subscribers, and continually tested email strategies more than their counterparts. While U.S. companies frequently tested the subject lines of their emails, Germans were more likely to test the content of their emails. French companies, on the other hand, continually tested the best time and day to send emails. Well, me too. Over half of consumers and prospective customers said they would rather receive information from brands they follow via email. Communication with brands via email gives a bit of privacy and space, compared to when promotional text messages show up in your smartphone’s inbox. The first email that introduces a new subscriber to your brand is known as the welcome email. They are characterized by an unusually high open rate. You can take advantage of that by including a short offer of your products in it. This works well as consumers no longer follow an orderly sales funnel. Their buyer’s journey has become irregular as seen in these content marketing stats. You might be afraid of using emojis in your emails. Well, this stat shows that you’re not alone. Only nine percent of emails actually use emojis in their subject lines. In case you decide to try it out, conduct a split test and check the results. Send out an email with an emoji and an email without one, then see which of them got the highest open and click-through rates. Majority of digital marketers haven’t started personalizing their email subject lines. Email personalization is something as little as mentioning a subscriber’s name and delivering targeted messages. Some marketers can’t personalize their emails because they haven’t included a field for First Name or Full Name in their email opt-in forms. Most marketers just prefer to have only the field for email addresses, with the knowledge that it converts better. Try adding a field for the First Name in your opt-in form so you could personalize your emails and see a 4% higher open rate. Half of all small and medium-sized business owners use marketing automation tools like ConvertKit to send out emails in drip sequences. These are automated emails that go out to new subscribers at selected time intervals. Most business owners do not have time to create fresh email newsletters. Instead, they create a series of emails in a campaign and schedule it to go out at different time intervals, maybe a week or three days. Email dripping and automation saves marketers a lot of time. Use ConvertKit to get started and create email drip campaigns for your subscribers. There are many ways to personalize email content, from targeting subscribers who signed up to a particular opt-in form to age, all the way down to the country of residence. A significant amount of marketers personalize their email content by the age of their subscribers. Emails they send to 18-29 age groups are different from the ones sent to 40-65 age groups. Dynamic content in email entails showing personalized HTML content to your users based on how they engaged with your brand. Sixty-five percent of marketers attributed this to their email marketing success. An example of this is when Adidas tagged their male and female subscribers and showed men’s wear to males and female wear to females. That increased user engagement and they recorded more sales with that personalization strategy. A handful of marketers believe their ROI is buried in their email lists. This is not far from the truth. Email marketing generates the most sales for companies worldwide. Creating an automated series of email campaigns sets up the sales funnel for you and land you sales on autopilot. You set up those emails and they go out to subscribers sequentially as they sign up to your list. Emails are handy and apt to engage with subscribers in a personalized way, and seventy-seven percent of marketers are already taking advantage of that. An easy way to personalize content is by creating different email campaigns or autoresponders for different lead magnets displayed in your opt-in forms. Based on what consumers subscribed for, you’ll be able to send targeted and personalized emails that’ll increase your open rates and boost sales. Gmail is the most popular email platform for both personal and business use. It currently boasts of having over one billion active users. Great news for marketers. This stat shows that the majority of people communicate using emails for private and commercial purposes. With email being the universal mode of communication between people and brands, the majority of users check their email inbox first thing in the morning. Most people, including me, do not want to miss an important business email for any reason under the sun. I personally love to respond to an email on time, and I guess many people have that preference too. You just might be overwhelming your subscribers with a massive amount of emails. 60.4% of subscribers revealed that they simply receive too many emails. Surprisingly, only 4.4% of consumers say they receive too little promotional emails, leaving 35.2% of users with just the right amount of promotional emails. Want to know if you’re sending out too many promotional emails? Check your open and click-through rates. If they’re getting low, chances are you should review your email campaign and strike a right balance between promotional and non-promotional emails. Also, keep an eye out on the number of unsubscribes you’re having. The number one reason people gave from unsubscribing from emails is the overwhelming volume of emails they had to put up with. However, with CAN-SPAM law in place, it is likely they forgot they had exchanged their email address for a freebie or they didn’t know they were going to receive marketing emails after submitting personal information to a website. The average order value of mobile emails grew by 28% in the first quarter of 2013 and 2014, doubling the yearly growth of desktop average order value. Since the internet has now turned into a mobile-first web, it’s not surprising that traffic from mobile emails is more valuable than those from desktop emails. With the superior value of mobile email traffic to desktop emails, marketers are now prioritizing how their emails are seen and viewed on mobile. Mobile has taken over the internet. Everything from the look of your website, down to your email, has to be optimized for mobile devices before desktop. In 2019, the number of people using email is projected to be at 2.9 billion. That’s an incredible number of potential subscribers for marketers out there. The numbers are only going to keep increasing as the years go by. Its important marketers stay ahead of their email marketing game to convert as much of these users as possible into their marketing lists. It just so happened that it’s not the “blog about blogging” industry, neither is it the fashion nor the health and fitness industry that has the highest open rates for emails. Of all industries, it’s the pet and animal services. Seems like commitment to pets is stronger than the devotion seen in the making money online niche. Young people below 35 years of age make up the majority of those that regularly view their emails using smartphones. Marketers can no longer ignore mobile devices. Optimizing emails for mobile devices, and even tablets should now be a part of the marketing strategy for smart marketers. Mobile devices have trumped desktop in almost all facets of user engagement online. Smartphones have become the primary device to check emails. Times have changed, and marketers must innovate or get left behind. One important criterion to look out for when choosing an email marketing automation software is the mobile responsiveness of the email content. Android smartphone users spent a considerably longer amount of time viewing emails than desktop, iPhone, Android Tablet, and iPad users. Whatever the reason for this, it beats the time usage by desktop users who came in at second place. A sizeable amount of people complain of getting irrelevant emails from brands they are subscribed to. This could be traced to the inability of companies to properly segment their email subscribers. Email segmentation can easily fix this complaint. Sending email messages to consumers based on the information they engaged with on your website is what’s considered as relevant. Emails sent from mobile phones have a median reply time of 28 minutes, emails from tablets have 58 minutes, and desktop has a 62 minutes median reply time. This stat makes it tempting to send work emails from mobile devices, even if sending emails from desktop feels more professional. 62% of users check work emails on a desktop, compared to 35% that check work emails on a smartphone. Smartphone users were seen to open personal emails more than business emails. We’re mostly in work mode when checking emails on the desktop, and we’re more relaxed and disconnected from the workplace when using our smartphones. The word count of replies sent from mobile phones is 20 words, tablets contain on average 27 words, and desktop usually has 60 words as email replies. It’s far easier to type a lengthy response with the desktop keyboard than with a smartphone. In Poland, 45% of people opened an email on webmail, 30% viewed email on desktop, but only 25% checked their emails on mobile. Looks like the rate at which email usage on mobile devices is growing hasn’t gotten to Poland yet. 65% of users view their emails at home, while only 23% of people check their emails at work. One would think that the workplace is where emails are supposed to be checked the most. Between work and home, 59% of people checked their emails on the go while using a mobile device. Almost all smartphone users visit their email inbox daily. Our smartphones are with us most of the time. Scratch that. Our smartphones are with us all the time and it’s very tempting to check out who sent you that last email that popped up in your notification bar. Mobile-responsiveness remains an important factor when choosing an email marketing automation software to build your email list. Half of the brand customers actually made a purchase after reading a promotional email. That’s the power of email marketing. The trick here is to space out your promotional emails so your customers don’t feel like they’re continuously being sold to. The money is in your email list. The gender-based difference in conversion is worth taking note of. The male folks probably put off engaging with promotional emails to the afternoon for the purpose of morning productivity. We could narrow down the time we send out emails to morning and afternoons, capturing both our male and female audiences. Revenue that was gotten from mobile emails made up twenty percent of all revenue generated from emails. With changes being made for more emails to be responsive, the revenue from mobile emails will surpass those from a desktop. Just be sure that your emails are optimized for mobile devices so you could reap all the benefits of mobile revenue. Mobile-friendly themes for websites are not in short supply online, that’s why it’s easy for most brands to have mobile-friendly websites. The idea of mobile-friendly email designs haven’t resonated as much as mobile-friendly websites, and that’s why some brands are still without one. A popular email marketing software that’s mobile-friendly is ConvertKit. Though a number of brands are without a mobile-responsive email design, the majority have caught on with complete mobile-friendly websites and emails. Some additional mobile-optimization tips for email is making the font of the body text large so that users wouldn’t have to zoom in to read it. You could also break up long blocks of text into shorter and one-line paragraphs. Thirty-two percent of marketers don’t just send emails without testing how it appears on different devices first, especially mobile phones. Though time-consuming, it is a good practice for professional marketers. Most email marketing software allows you to send a test message to your own email. You could open it on your smartphone to see how it appears and make changes where necessary. A handful of marketers have no strategy for email marketing in place. Only thirty-four percent possess a basic knowledge of email marketing and are applying it. Email marketing is a powerful channel for making sales and increasing revenue if done correctly. More than half of marketers report that they’ve optimized their email designs for mobile devices. Email audience has now shifted from being majorly desktop users to mobile users. It’s only a matter of time before mobile email usage exceed desktop email use. If the emails in your campaigns don’t display well on smartphones, all your promotional emails risk ending up in the spam folder, as mobile users are ready to do just that. Test your emails when setting up a campaign by sending it to your personal email address, so you could check how it’s displayed on your smartphone and correct one or two things. Majority of companies that send out emails daily make sure their emails are mobile-friendly. Mobile-responsive emails reduce the number of unsubscribes and the likelihood of your emails being marked as spam. The good thing is, if it looks good on mobile, then it’ll surely look good on the desktop. The pre-header text is the text you see next to the subject line in emails. Thirty-two percent of marketers use the pre-header text for promotional purposes in an attempt to optimize emails for mobile devices. The pre-header text is usually not seen in the email content itself. However, if it’s click-worthy, it can increase email open rates. Some other marketers focus on A/B testing the subject lines of emails in an attempt to make their emails more mobile-responsive. They do this by inserting their key message in the first 30 characters of their email subject line. Split testing the subject line of your email will increase open rates in desktop, as well as mobile devices. Email is a powerful marketing tool to build trust and credibility with your audience. Customers are more likely to make a sale in your emails than on blog posts. An email drip automation campaign. This lets you schedule several emails to send out at time intervals, maybe weekly or after a specified number of days, as you wish. Email segmentation. This feature allows you to create different campaigns to group subscribers based on what they engaged with on your website, allowing you to send relevant and targeted emails to them. Email personalization. The ability to address a subscriber by their name. Automation rules and workflow. With this feature, you can create a rule for subscribers to be automatically moved into another email campaign after completing a previous email campaign that gave out the lead magnet the subscriber signed up for. PRO FEATURE: Ability to send emails to subscribers that didn’t open the first time. This is why ConvertKit is the most popular email marketing service out there. It has all these professional features, making it the ideal platform to start building your email list with. You can get started with ConvertKit here if you want to go professional with your email marketing. If you don’t have enough traffic to your site to get visitors to subscribe to your email list, to begin with, download my Traffic Blueprint For Blogs for step-by-step traffic strategies.